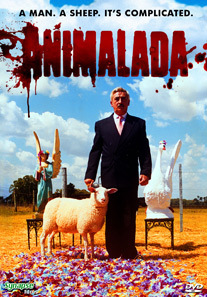 Argentinean writer/director Sergio Bizzio directs ANIMALADA (aka ANIMAL) the extremely bizarre and horrific black comedy about a man who falls in love with “Fanny”, a sheep at his family’s vacation ranch! Distracted and unhappy with his current marriage, Alberto (Carlo Roffe) seeks comfort with “Fanny” in a nearby barn. He tries to hide his beastly relationship as long as he can, but family matters soon get in the way and people start to die horribly, as Alberto kills and grinds up body parts into his new partner’s food. His relationship with the farm animal is taboo and the secret must be kept… even if that means putting his own family in jeopardy! Arguably one of the most jaw-dropping and bizarre titles ever released by Synapse Films, ANIMALADA is sure to please horror fans with its unconventional humor and shocking subject matter.